How Far Will Walking Take You? In the world of physical activity and exercise, how far will walking take you? This quote by Ellen DeGeneres, all kidding aside, implies people who walk daily will reap a host of health benefits. Sources agree that walking boosts memory and battles obesity. In addition, walking helps address other health concerns like diabetes, high blood pressure and cancer. Other physical benefits include toning the rear and legs, as well as enhancing balance. Two bloggers share their own ideas and benefits of walking. 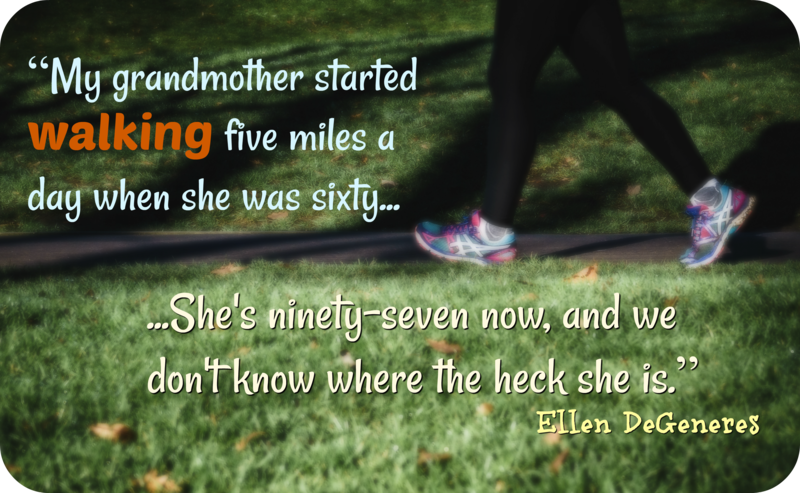 Donna of Retirement Reflections, recently shared Building Walking into Your Lifestyle as a guest post on Sizzling Toward Sixty. Tony, long-time blogger at One Regular Guy Writing about Food, Exercise and Living Past 100, shares a wealth of information on his page Why You Should Walk More. Some benefits I have experienced is how walking de-stresses me and elevates my mood. Often times, walking simply helps me solve a problem or think of a great blog post!
! I agree with everything you say about the benefits of walking, Terri.
! I walk every day and you’re so right! When I was young I thought I don’t drink or smoke so I will be healthy. Thanks for this! I walk every day and you’re so right!! Firstly this interesting post and conversations are on the most clicked list for a feature on the Blogger’s Pit Stop. In fact, your posts have taken out the top two spots. Congratulations. When I was young I thought I don’t drink or smoke so I will be healthy. Not so! I would be considered ‘over the hill’ but I have never felt better in my life. I certainly walk every day. Four days a week I challenge myself with very steep hill walking, a benefit of living on a mountain. Health is an all round thing, not just diet or exercise, as vital as they are but include mental health and spiritual health for a great outcome. I love to walk and it is our favourite way to discover a new City when we travel, it is such a great way to see so much more. I walked to work every day when living in London. That was a 7-mile round trip. Then, when I retired, we got our dog, Toby. I agree with everything you say about the benefits of walking, Terri. Not only that, but I’ve also made some great friends while out walking, but that may have something to do with Toby. Very good to hear! You must be in great shape! Ya gotta love Ellen! I get out of sorts quickly when i don’t get a daily walk in. I’ve begun fashioning walking sticks (that are necessary in our area – lots of loose dogs). Haha, I thought it was hilarious too. I walk with mine on the leashes, keeps other dogs away, lol! LOL. When I walk with The Old Man his leash dangles at his side. He’s the “king of the mountain” ’round these parts. He goes to work in town with Brother most days, so I’m on mostly own. For a long time walking was difficult for me, my knees would swell up and I was in a lot of pain. A knee replacement definitely helped that, I now I enjoy walking again. I still can’t walk long on heavy surfaces such as thick concrete, but that is what nature trails are for! I certainly agree. I’m thisclose to knee replacement myself. Trying to avoid it though! I used to walk every day until my feet and knees started to make it much harder. I miss it. I can feel the difference not walking is making in my energy. What I need is someone to walk with. I feel insecure continuing to go out alone to explore the way I used to because I never know when my knee will decide to act up. The neighborhood also isn’t as safe as it used to be. I hate walking on a treadmill at the gym, but I have to go there for the stationary bike to help my knees. Wanting to be out in nature is what motivated me to walk. The scenery at the gym just doesn’t cut it. Great ideas, I love walking and try to get out everyday. It helps clear my mind and lets me think, if that makes any sense!! It totally does…I get my best blog post ideas when walking the dogs! My grandfather used to take long walks everyday and he lived to be 90. I personally think walking is one of the best kinds of exercise there is. That is great to hear, Fabi! I used to love to walk. Now, I can go about a block or two before I have to stop for a rest. However, I do swim three days a week and it feels great! This morning I walked all over Walmart and it did me in for the whole day. I begin my new MS infusion on Tuesday. My neurologist and I have discussed the increase in my fatigue and will wait and see if the new medicine makes any different. I’ve heard good things about it so far! I hope you and your doc can find relief for you. I know several people living and coping with MS! Very glad to hear swimming works for you! Keep it up!! I swam competitively for 11 years so that is my go to exercise! A lovely quote, Terri, and a great post. Thanks, Robbie, Ellen is a crack-up! I agree that walking is an easy and enjoyable exercise with great rewards, one of them that I don’t have to go to a gym or “health spa” – something I intensely dislike. But a word of caution. My mom walked several miles for many years – until her Alzheimer’s made it too dangerous. Living a healthy lifestyle as you promote is a great regimen for everyone, but some awful things may happen anyway. Not a reason not to walk – or do anything good for body and soul – just a suggestion to be sensible. All true! We only get so much time on this planet, so making the best of those years, living a quality lifestyle, should be everyone’s goal. My husband and I love to take walks…it’s a great time to have “together time” without those technology distractions!! Hi, Terri – Thank you so much for linking to my recent guest post on walking. I am currently in Spain getting ready to begin my 700 km walk on the Camino Trail. I’m excited and nervous all at one time. Ill keep you posted! So happy to to do it, Donna! Enjoy the trek of a life time!! Can’t wait to read about it all! Thanks for the heads up, Terri! Much appreciated! Hope to send a few readers your way! Love your walking page! Thanks, again! I appreciate it! I love to walk! The hills around my neighborhood provide the perfect treadmill for an hour-long workout. I’m already a big fan of Donna’s… I’ll check out Tony’s blog. Oh, I am forever jealous of SD’s hills and dales! When I’m there I walk like crazy, great for glutes!